No Adidas jerseys (practice or game). Adidas socks and clothing, but that was it. The sale was pretty picked over already and today was the first VIP day for season ticket holders. Glad I didn't bother waiting in line Saturday. 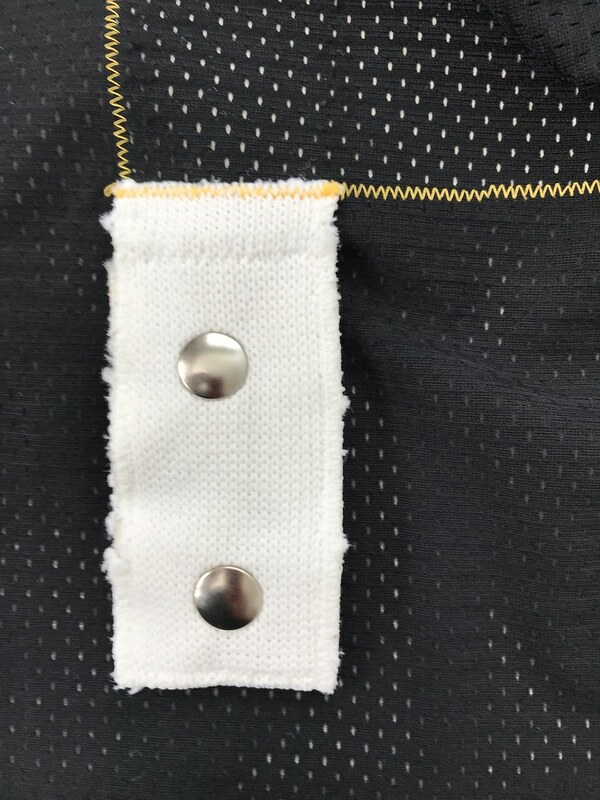 I was emailing Meigray the other day and they said all Adidas practice jerseys they have are on the site and there won't be any new stock added for the expo. Was really hoping they'd add some size 54 jerseys at a slightly discounted price for the expo, but it doesn't look like that's gonna happen. Might pick up a black and white 56 practice jersey just to have. Got my hands on another TBTC with incorrect customisation and had it re-done as a Fedorov. Goes nicely with the Yzerman I have. Keen to grab a Konstantinov & Lidstrom in this style so please sell me yours; blank also acceptable. Thank you. 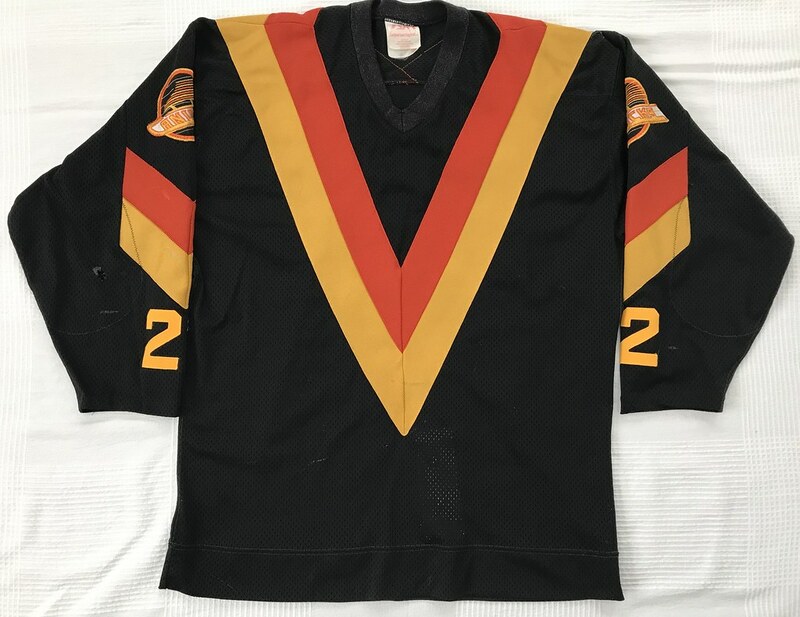 This is now the oldest jersey I have in my collection - so ugly, but so cool! Thanks to JJM4 for the fight strap. The bottom picture is from a game worn jersey to show how they attached the fight straps back then. I tried to recreate this the best I could. Holy crap, that's amazing. 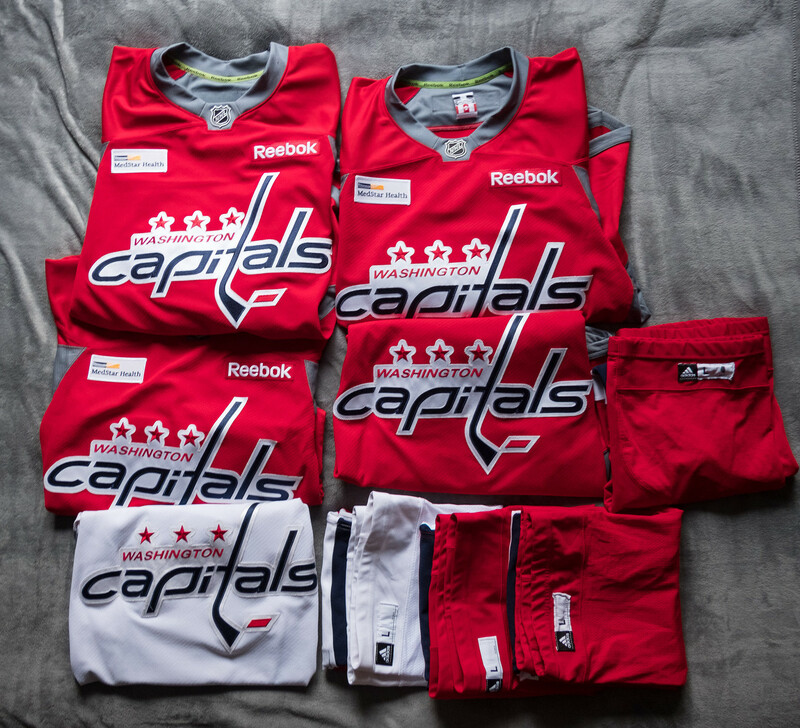 Did someone strip a used jersey? I see burns on the sleeves. Love that Williams! What an awesome add to your collection! Great jersey and very nice of you to show your support. Still shocking to think that the unthinkable can happen. Quick nerdy story... but that jersey and it's colours takes me back to my youth. I'm from Saskatchewan in a town that has an SJHL team. When I was probably 9 or 10, the league or maybe just local sporting goods shops came out with track pants in an array of different colours representative of the teams in the SJHL. My hometown team is/was the Terriers and their colours are Flyers colours white, black, orange. Naturally EVERY kid had to have the local teams colours as it seemed all my friends had a pair in the Terrier style. 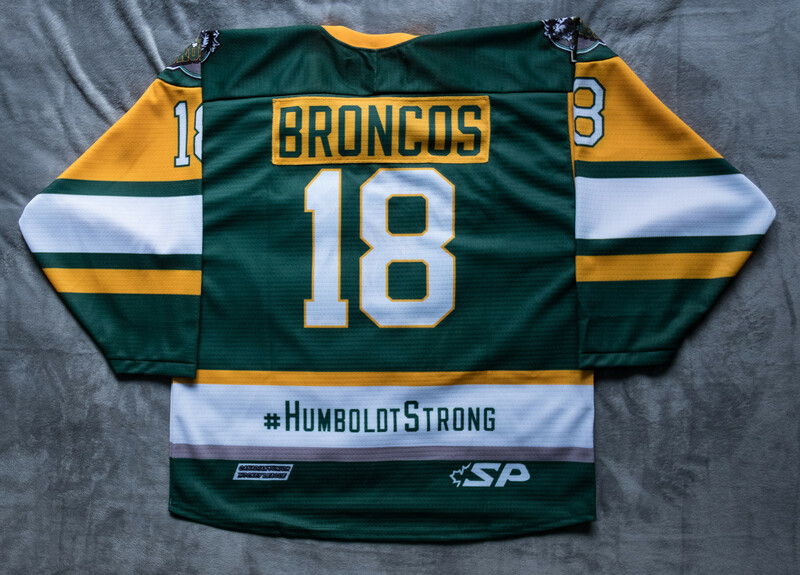 I on the other hand opted for the rare Humboldt Broncos colour scheme and was probably the only kid in town rocking the green pants with white and yellow striping. Following the green theme I not surprisingly ended up a North Stars fan. Love the jersey - just wish it was bigger. 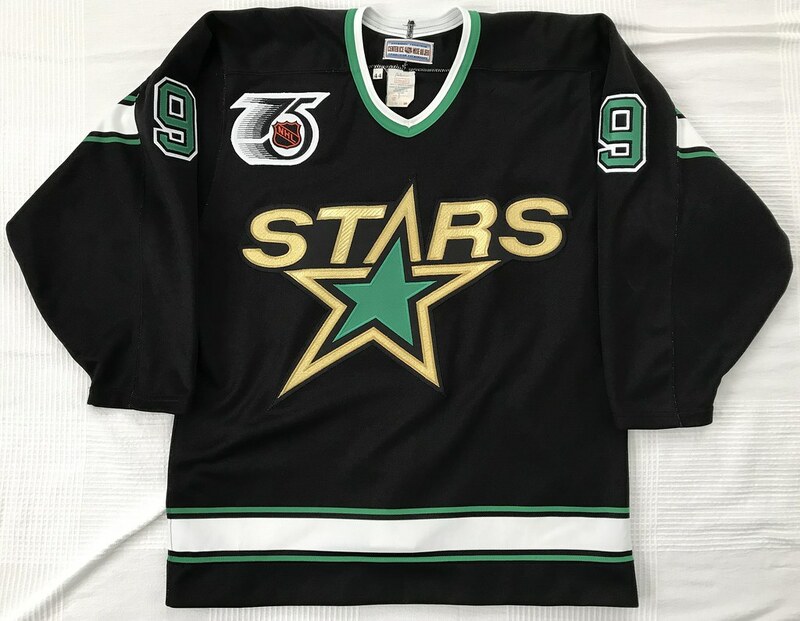 I have been wanting one of these Ultrafil North Star jerseys for a long time, but a 44 is so small. I might end up selling it - but if someone has a one that is too big for them and would prefer a smaller one, I would be willing to trade - PM me. For the first time in about a year, EPS now has none of my jerseys. Using a combination of mostly eBay bucks (free money) and a few dollars hanging out in my PayPal account that weren't otherwise earmarked, this blank was essentially "free". So I re-did a jersey i sold and regretted. I had the extra 25th patch, they just retired his number. Why the hell not. 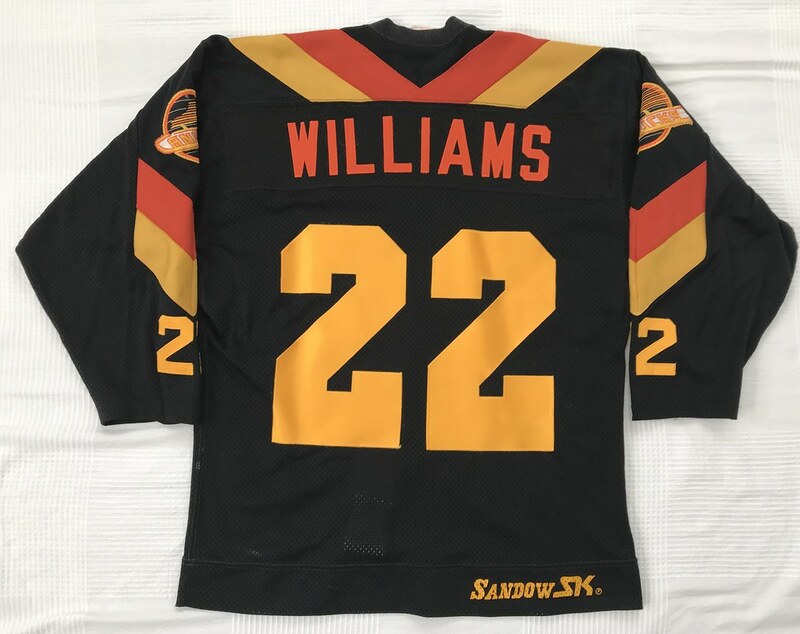 I bought this next jersey blank, with the intention of slapping a Devils crest on and some holiday accents to make a true "Christmas" jersey. Basically just to troll my family by wearing a Christmas themed jersey on Christmas. But, once the crest came (retro colors, of course), I liked how it looked too much. Because green jerseys almost always look good. So I made my own third jersey. So I'd paid for a blank, and a crest, and sewing to attach the crest, all for what was supposed to be a holiday prank. Why not invest even more in a replica and have it customized as well? 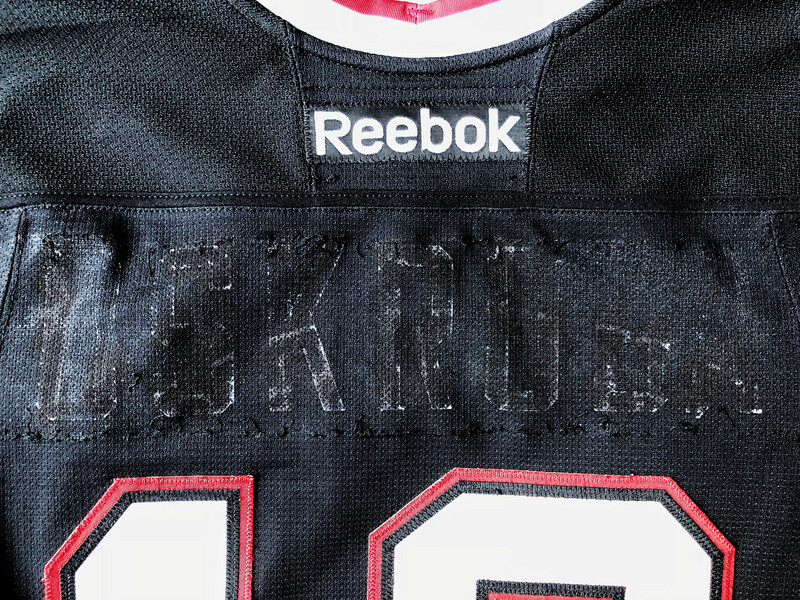 Sewn on twill, usual Devils style, but red under the white instead of black. I think it looks pretty cool, and if they were going to put out a new 3rd jersey rather than running the old retro style out there as a 3rd, I would not object to one that looked something like this. wow, that is great... ........... you know what would be even cooler, it the shoulders were white or red! what you say? I'd say red, but either would look pretty cool. Yeah, i say red as well...... but that would be impossible for you to do, right? Impossible, no. For me, yes. And I don't think I am about to add more money into this project for that purpose. Sweet alternate-universe alternate jersey! I wouldn't mind too much if the Devils third goes in that sort of direction. Nice pickups, Spud and Fitz. I'm woefully behind on pics, but this one was easy so I'll post it. 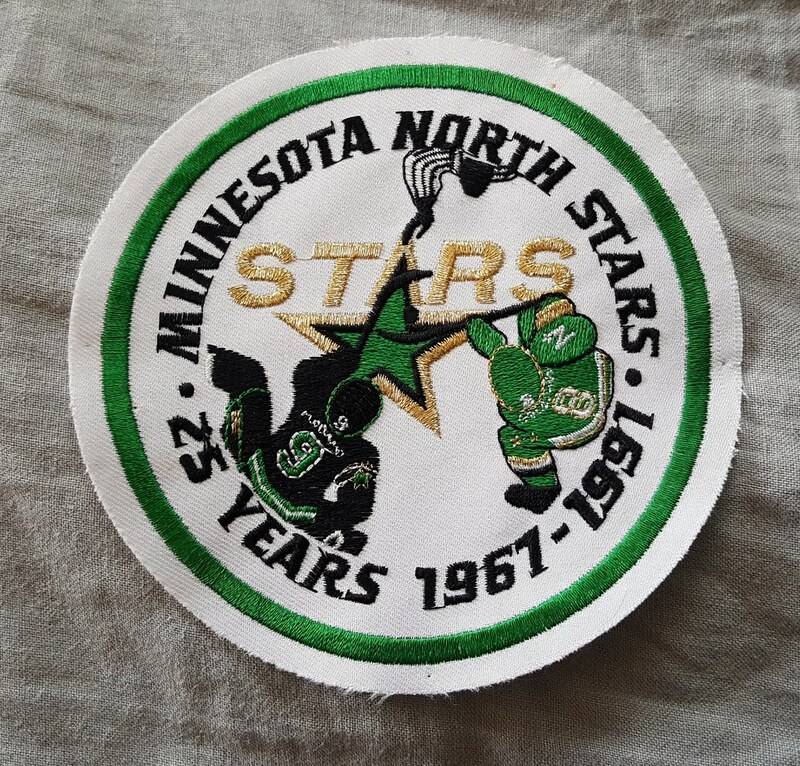 Found what looks to be an original North Stars 25th patch to go on my black ultrafil. I hope I can massage out those pinholes, but even as-is, I'm happy to have it. 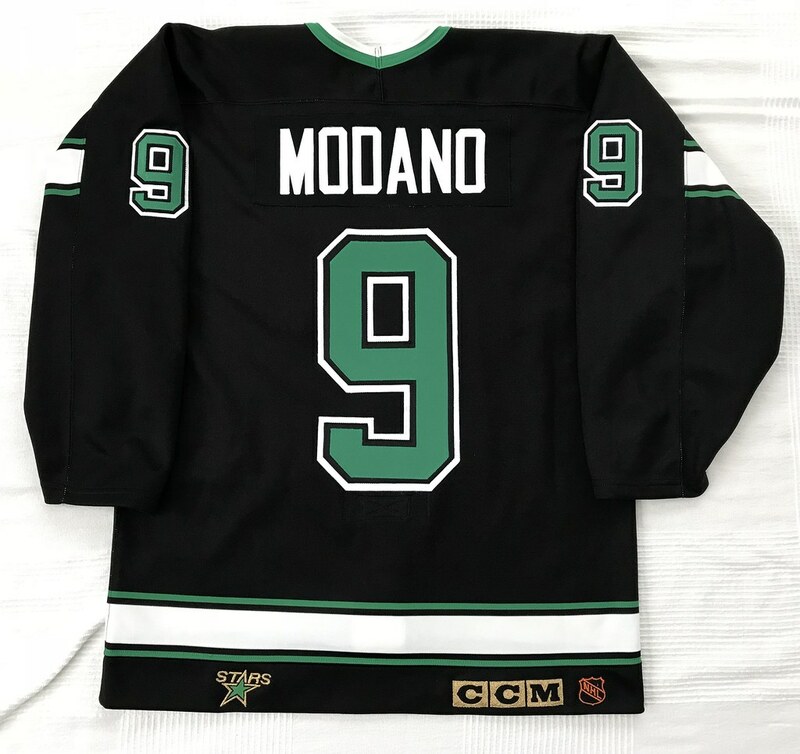 That is the exact patch that needs to go on the Modano I just posted. You won't see the pin holes once is it ironed and sewn on your jersey. We both know it won’t, of course. #EmojiCrest. It's been a while since I posted anything. Picked this up a while back but never got around to posting it. Bought it on Facebook but I think the member is on here too. Also very happy to add my first MiC Adidas jersey to the collection - Blues legend Nate Prosser. Not sure what the story is with this jersey. Won it via Blues charity auction. There are no indications it was ever worn as it still has the born on sticker and there are no "official game jersey" tags either. It's also a size 52 which I found surprising as all of the Prosser gamers I found were size 56. Plan on stripping it but not sure who to put on it yet. 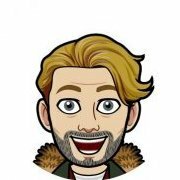 Right now I'm thinking Parayko but will wait to see what happens between now and October. I loved those Vintage Blues jerseys from 2004. I had a few game worn ones a while back and have regretted moving them ever since. They need to bring back that style. 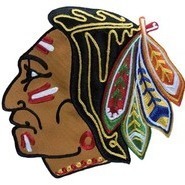 Would love to see the Blues bring it back as a third this season but I've heard they'll be going with something that's identical or very similar to their Winter Classics, which is okay too.